« Should An Effective Developer Innovate, Imitate or just Integrate? 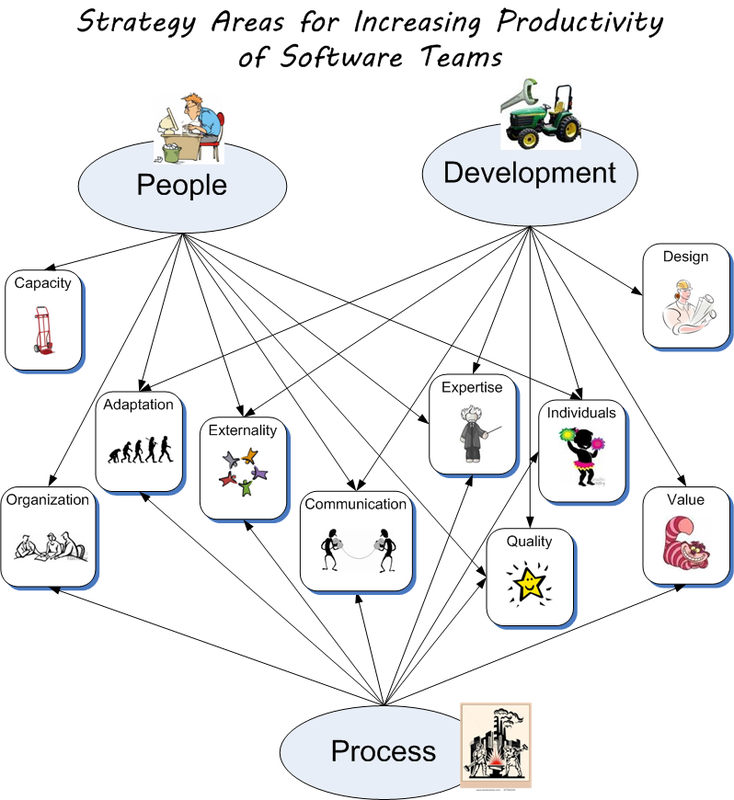 Seasoned project managers will tell that delivery of software is result of many trade offs. The main trade off is between Time (when project will finish) and Scope (how much will be done). This post will show that using right tools you could gain improvement for both variables. While it is possible to create orderly step-by-step process for increasing productivity of software teams, it will never be ideal – too many variations and situations will hinder it usefulness. I believe in set of useful tool that could be combined to craft custom optimal solution. There are several strategies that lead to increase in productivity – how many units of scope software team can produce within fixed time. New people increase volume of possible work within the same time and new expertise increases range and quality of tasks. However, the increase in output is not linear and quickly diminishes, because more people cause communication and coordination overhead. In addition, compensation increase make this tool expensive and less attractive. Tips: Form few small teams to avoid large group overhead and scale by parallel development of system components and sync within team of teams. Also remember what Fred Brook said: Adding manpower to a late software project makes it later. Happy motivated people are more productive, focused and concerned about quality and end result. While there is no common receipt for each individual, I believe there are some strong motivators: interesting and meaningful work, fair compensation, control over own tasks and outcomes, ability to learn and professionally grow, comfortable workplace and adequate tools, empathetical and caring management and so on. The Ideal Software Company. Utopia? Tips: Give opportunity for people to learn things that are beyond immediate needs of the project. Ability to learn and perspectives of growth are the strongest motivation factors for majority of software professionals. Nobody recommends involuntary overtime for a long time as benefits will disappear quickly when a stressed team lowers quality and starts breaking apart. Tips: Use overtime as a last resort for very short period. Good leaders jell teams, align people with goals, boost energy and remove barriers. Leaders vary from commanders to visionaries and each style has merits under specific circumstances. Right leaders are essential for the project success. A software team requires range of skills and involved in different activities to achieve end goal – implemented software system for customer needs. Beyond software implementation the team deals with a customer domain, company vision, market demands, technologies, operation environments and other project aspects. The team is involved in research, analysis, coordination, design, architecture, usability, testing, deployment, hosting and other activities. Therefore team players should be able to play different roles and have expertise to cover various aspects to ensure good end results. Tips: A high degree of specialization and separation of roles is inevitable for large teams and projects. However specialization can hurt the project as people forget about big picture, holistic solutions and instead focus on what is important for their local area. The team leaders should pay a lot of attention to Alignment to counter-attack sub-optimization and locally focused decisions. Tasks and challenges should match skills and experience of team players. It doesn’t make sense for backend developers to convert Photoshop files into html or conduct marketing research and focus groups. If team cannot afford to hire a permanent specialist, they should try to find professional mercenaries who will do work faster on higher quality level. Tips: It is more difficult to align outsiders, who don’t have long-term commitment and interest in the end result. Communication and clear understanding are hard to achieve. Preferably, outsiders should be assigned well-defined tasks and sub-projects with clear outcome and frequent validation points. Flow (or Immersion) is a state of mental focus so intense that awareness of the real world is lost, generally resulting in a feeling of joy and satisfaction. When learning and tasks are too easy, people become bored. If they are too complex they become stressed and frustrated. Flow happens when perception and understanding are challenged near capacity without being exceeded. Few people will be always disciplined no matter what and few will always violate rules. Majority are context sensitive – relax than discipline is low and work hard when discipline is enforced. Build a minimal set of rules approved by majority and stick to these rules. Tips: Too much discipline could significantly deprive productivity, motivation and promote compliance instead of dedication. Reality is complex, fluid and unclear. Many assumptions and plans quickly go bust. The process that has built-in mechanism for signaling problems and self-correction is the most effective. Rapid feedback is the core part of such process. Tips: Iterative development is one of the best examples of the process that relies heavily on feedback. How to become an Expert. Embrace Reality. People jump significant gaps to understand each other – sometimes without much success. Clear vision, smart priorities and honest evaluation allow team players moving in unison and enforce each other. Good understanding focus people on right goals and reduce wasteful activities. Communication and trust are important for alignment. Quality of decisions cause projects failure or success. Good decisions are based on correct information, experience, goals, feedback, expert opinions and so on. Decisions could be centralized, consensus based or delegated to lower level. The project should have right mix of these styles, but most effective decisions are made by people who will implement them. In addition, involvement in decision making empower people and give them sense of control. Good Quality Assurance makes projects solid and expose not only bugs, but serious system flaws – requirements discrepancies, problems with user experience and system inconsistencies. Low tolerance to quality problems should be a working principle. The team should have mandate to stop and fix root problems immediately and avoid patching that causes painful chronic problems. Tips: Productivity could decrease if QA becoming ceremony and impede efficiency and speed of software team. Automation of routine testing could help. As project progresses you will find problems, wrong assumptions and challenges. You will have better experience and understanding. Even brightest ideas, best practices and excellent analysis and design could become outdated and ineffective. Continuously look for improvements, eliminate waste and bottlenecks. Highly productive team shouldn’t waste time on routine or non-core activities. Routine work should be automated and non-core work outsourced or covered by external components. The team should focus on high value-added distinctive work for business and application domain – this will bring maximum business results with minimal development effort. Experienced users can support beginners, and provide valuable advices on forums and social applications. They can be co-creators of content and even functionality. Passionate users can promote and market your software better than advertisers. They can generate great ideas and provide valuable feedback about your applications. Tips: Community groups could pursue own goals and sometimes are difficult to align. Select most optimal process for creating value. Tips: Use different flows for distinct stages of software creation. For example, a team process can internally use real-time flow, with external teams – Kanban and with consultants Heijunka. Connect a software team to a customer and allow them to make most project decisions based on brainstorming, learning and changing situations. Tips: Not every team can self-organize – it requires maturity. And loss of direct control could be a problem for management if a project departs from company strategy and desired parameters (as budget, standards, resources). Reuse code (components, libraries, solutions) as much as possible to speed up development and minimize code base. Reuse will bring familiar tested solutions and prevent frequent re-inventions of the wheel. Tips: Design for reuse requires skills and time. It is easy to overly complicate the system by pursuing reusable code. Evolve and refactor code to achieve practically good reusability. Sometimes custome solutions are lighter and better suited for specific purposes than generic and reusable. Complexity and poor understanding of the system is one of the worst problems in development. Design, code and concepts should be as simple as possible and clearly understood by the team. Simplicity and clarity are difficult to achieve and require special effort. It is much easier to produce convoluted over-engineered solution for complex problem (Ball of Mud) than simple and elegant solution. Tips: Great design achieve simplicity by abstracting numerous details into simple concepts in process of solution evolution and learning from implementation. Innovation is expensive, uncertain and leave you with custom solutions on your own for support and future development. Piggyback on actively involving products, especially for non-core problems where good and proven solutions are available.Tips: Innovate to gain business advantage or solve serious technical challenges if you have an outstanding team and well-defined problems. Keep technical ideas and code concepts close to the customer domain. You will achieve consistency, better sync between system and business concepts. You can easier translate customer ideas into the system and customers will understand your implementation better.Tips: Domain Driven Design is one the best approaches to achieve synthesis of technical and business ideas for complex domains. Start with the simplest primitive solutions, enforce early use and seek for feedback. Adjust and improve design before continuing adding new features. Look for better ideas and abstractions. Delay fundamental design decisions until you are confident about system development direction and validated ideas on practice. Do not over-engineer and add unnecessary features. Tips: Evolution main deficiency is slowness. Modern businesses often don’t have time for many improvement cycles – they want results now. Ideas in Software Development: Revolution vs. Evolution. Part 1. Open your solution for external developers who can extend and add more useful features. If you are lucky, you will get much more functionality than you can build internally while still controlling a core solution (iPhone is a perfect example). Also Open API (convenient and supported by good documentation) give developers eligible ways to interact with you system without hacking or completely ignoring it. Tips: Once Open API is used it becomes liability – next design decisions will be affected by compatibility and legacy concerns. Famous design patterns are built around these principles. Follow sound design principles to build flexible, easy to expand system. The team should collectively own code and pursue consistency and use of best practices. Otherwise the system will become clash of isolated impassible code islands – scary for people who didn’t build them. Share code and learn from each other to build outstanding system with high quality and integrity of every component. Technologies and outside world expectations are changing. Shift to better technology and tools allows effective solution of new challenges and meeting new needs without pushing people and old technologies to grinding. Did I miss any tools? What tools do you know and successfully use? this article is quite big for my head to digest, nevertheless i can try to give an answer to your question.